The Global Social Economy Forum GSEF is an international network that brings together local governments and civil society stakeholders committed to supporting the development of the Social Economy (SE). Through the collaboration between social economy organizations and local governments, the GSEF pursues creation of quality jobs, fair growth, progress of grassroots democracy, and sustainable development. Values such as human dignity and sustainable ecology are to be the underlying principles for every activity of the GSEF. Welcomed by the Mayor of Seoul, Won-Soon Park, the GSEF reaches its 4th edition with the central theme “values and competitiveness for an inclusive and sustainable local development”. 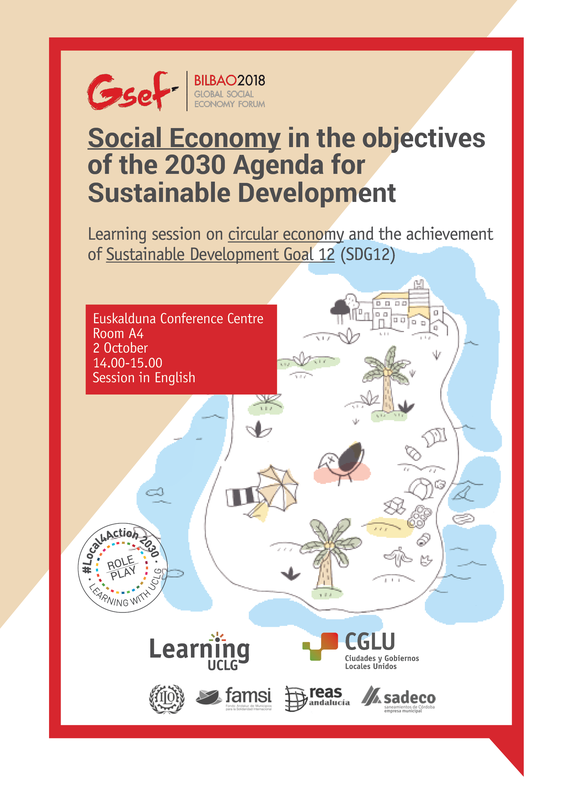 Within the framework of this forum, a learning workshop will be held on 2 October with a Role Play about circular economy. The main objective will be facilitate a dialogue through a game with possible scenarios to understand the circular economy and the variables which influence decision-making on waste management. Participants in groups will have acquire a different role, e.g the mayor, an NGO representative or the spokesperson of the tourist group and find common solutions to overcome the challenge. The goal will be develop an understanding of the ways in which different actors behave in order to seek agreements in multi-disciplinary teams. This workshop will be one of the main CGLU participations and events in the #UrbanOctober. Click here to see the progamme of the workshop! (in Spanish). See the full programme of GSEF Bilbao Forum. Visit the dedicated website to the Bilbao Forum.